After public outcry, the library’s $300 million project to demolish stacks and sell off branch libraries has collapsed. In November 2011, The Nation revealed the details of a radical plan conceived by the board of trustees of the New York Public Library: the removal of 3 million books from seven levels of historic book stacks beneath the Rose Reading Room, the subsequent demolition of those stacks and the insertion therein of a modern computer library designed by the British architect Norman Foster. How would the NYPL pay for such an undertaking? By selling two of its nearby libraries to private interests. It was a Bloomberg-era scheme conceived in absolute secrecy by the trustees, with assistance from McKinsey & Co. and Booz Allen, which was paid $2.7 million. The NYPL’s librarians were almost entirely excluded from the process; and not a single public meeting preceded the creation of the plan in 2007. Opposition spread quickly, for obvious reasons: the Central Library Plan was too expensive (the price tag was listed at $300 million; the NYPL admitted it could run higher); it neglected the needs of the NYPL’s eighty-seven branch libraries (which require at least $500 million to repair dilapidated facilities); and it entailed the mutilation of one of New York’s finest structures (“the whole building is a single architectural masterpiece,” one staff member told me in 2011. “The CLP would basically destroy half the library.”) The pressure became too much; today the library’s president, Tony Marx, announced that the CLP is being cancelled. He made the right decision. It’s a defeat for an institution that, over the last year, worked aggressively to move the plan across the finish line. The NYPL was keen to begin construction last summer, with Michael Bloomberg still in office, but a pair of lawsuits filed by critics prevented that from happening. 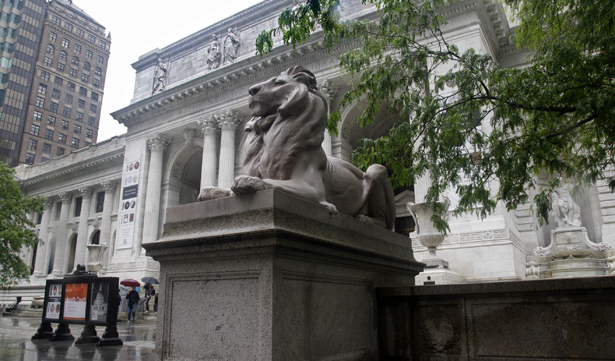 The NYPL later paid $25,000 to a well-connected lobbyist whose task was to mobilize the Teamsters, construction unions, clergy and immigrant leaders on behalf of the renovation. Finally, it sent a dubious mass-mailing to city residents, urging them, as it often does, to contact elected officials on behalf of greater library funding. But the letter was sneaky—buried in the fine print was language supporting the renovation. Credit for the NYPL retreat goes to the following: three vibrant citizen groups, the Committee to Save the NYPL, Citizens Defending Libraries and Library Lovers League, whose members worked around the clock for more than a year, and whose efforts prompted mayoral candidate Bill de Blasio to oppose the CLP at a July press conference in front of the Library; Micah Kellner, a New York State assemblyman who held a crucial public hearing in 2013 at which Marx received rough treatment, and who toiled behind the scenes to unearth details of the plan; and two exceptionally fine writers: Ada Louise Huxtable, whose stirring Wall Street Journal critique of the CLP was written from her deathbed; and New York Times architecture critic Michael Kimmelman, who not only demolished the CLP on the front page of the Times in January 2013 but kept the issue alive on Twitter and his regular Times column. Has the battle over the CLP truly ended? In an e-mail to his staff today, Marx declared: “No final decisions have been reached.” Four questions urgently need clarification: (1) it appears that the NYPL will retain the Mid-Manhattan Library, but will they fix it, or let it deteriorate even further, and sell it under a more business-friendly mayoral administration? (2) The NYPL hastily removed 3 million books from the stacks in 2013, in preparation for demolition; the stacks are now empty. Staff members say that because of the way the shelves were emptied, it will be extraordinarily difficult for the books to go back into the shelves that previously held them. Insiders also say that some books were damaged in the rapid removal process. Marx needs to tell us as soon as possible how many books were damaged. (3) The NYPL’s architect, Foster, has already received $7.9 million from the library for a design that was cancelled—an astonishingly reckless payment from a library system in chronic financial difficulty. But Marx, who leads an institution devoted to the dissemination of knowledge, won’t reveal the source of that money—did it come from the NYPL or one of its trustees? (4) Will the branch libraries, in a wealthy city, now get the funds they need to flourish? One suspects that the de Blasio administration pushed the NYPL in the direction of cancelling the plan; let’s hope the Mayor and his team clarify the rest of the story soon.